The club was originally formed in 1941 on the Singer Estate when it was used by the "Pool Board" a collection of Oil companies including Shell, Mobil, BP and Esso. At the end of the war Esso European Laboratories continued working on the site and in 1945 The Esso Bowling Club was formed and became affiliated to the Berkshire County Bowling Association and the English Bowling Association. In 1951 the Bowling Green was extended from four to six rinks. A highlight for the club occurred in 1959 when Esso hosted a match between the Berkshire County Bowling Association and an Australian Touring side on the Esso green. 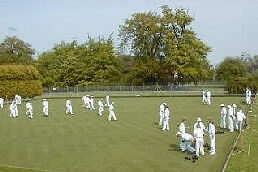 In 1970 the name of the club was changed to the "Esso Research Bowling Club" and in 1982 a Ladies section was formed. Around the end of the Sixties the Bowling Green was sold as part of the Mansion Estate Grounds, to W.H.Smiths Ltd. At the time of the sale Esso had an agreed seven year leaseback of the green,for the use of their employees. This was subsequently reduced to four years with an annual review thereafter before the contract was terminated in 1985. Esso then built a new green adjacent to the Social Club. This new green (below) was opened by Lenny Bernstein in 1986. 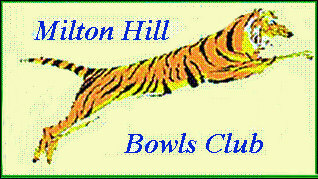 At the end of the1999 season the Social club and the Bowling Club became disassociated with the Esso name and the bowls club was renamed 'Milton Hill Bowls Club'. In May 2000 the Company gave the Bowling Club and the Social Club Members, notice to quit the Bowling Green and the Club house because the Research Centre was moving to America. Some compensation was paid by the Company towards the cost of laying another green for the existing members of the Bowling Club at another location. The Club continued with its fixtures in the 2001 and 2002 seasons by playing all of their matches on away greens. A debt of gratitude is owed to the many clubs who allowed us to use their greens during this difficult period. This enabled us to complete our League fixtures and was a major factor in sustaining the Club's identity. In 2002 land was aquired from a local farmer behind the Milton United Football Club. Work began in May, building a new all-weather bowling green and Pavillion. This was completed for the official opening on 4th. October 2002 (See Location) Since then the Pavillion has been extended to accomodate a short mat bowling facility, two new toilets added and a large floodlit Car park provided.